Give your customers confidence in your PEEL SHOPPING online storeshop! 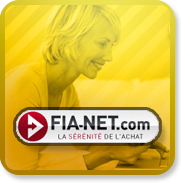 Turn your visitors into buyers using the SEAL OF CONFIDENCE - FIANET module! Adopt the trust mark No. 1 on the market! - 2 million hits to our annual satisfaction surveys! 83% of Internet users say that the presence of FIA-NET logo has influenced their purchase decision when they had a choice between two unknown sites for the purchase of the same product at the same price study FIA-NET - November 2009 - 836 respondents). Be careful, you must first sign a contract with FIA-NET.